10 years ago, my first feature film, I Need to Lose Ten Pounds screened at a grungy auditorium theater at UMass Dartmouth. 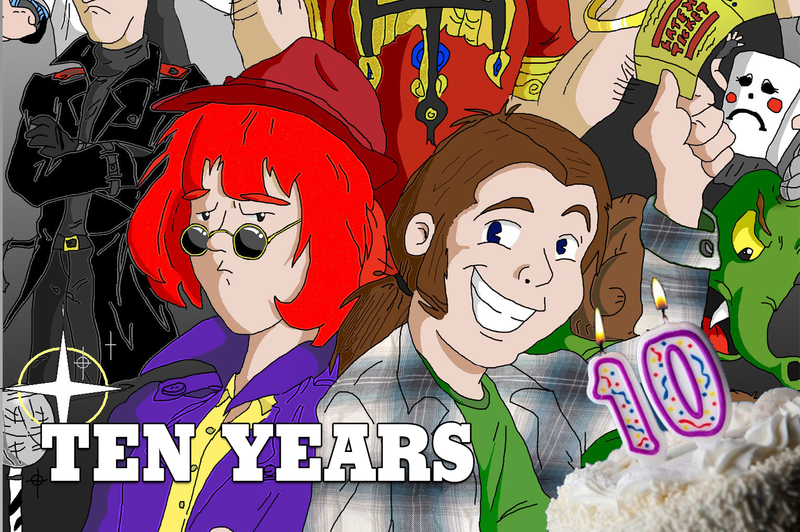 You only get your 10th anniversary for a film with “10” in the title once, so I thought I’d write up a little something. I started writing the movie with a buddy when I was 14 (8th grade). It was released when I was 20. Most of the effort was fueled by naive initiative, not knowing it was impossible for a 14 year old to produce and direct a feature film. It’s like “not knowing” you could never really be President, and then, therefore, somehow becoming President. Later in 2000, when I met Jon Hunt, it moved from implausible to plausible, as I now knew a guy who could write music, had what felt like an advanced understanding of digital video workflow (when, really, in 2000, no one did), and a little excess cash to buy a 24p video camera (for that real film look!). Jon and my pirate ship of misfitted friends spent the next three years simply learning the basics of filmmaking, producing shorts for every school project possible (even when it made no sense). We even tried shooting select scenes from “Ten Pounds” on weekends, but never quite got the full production under way. By March 2003, we scheduled a big shoot with a few minor special effects and a cool funeral home location, and considered that the first official shoot, even though it was later cut because it made no sense at all (as though “making sense” was criteria for staying in the movie). Hundreds of hours later, a few pretty serious setbacks, a lot of discouragement, and an abundance of filmmaking education led to a completed product in 2006, which went on to win the Tromdance film festival that year (and was acquired by Troma for distribution). When sharing my work with new fans, I do NOT lead with Ten Pounds – it’s an utterly stupid musical comedy with almost no cohesion shot on SD. And yet, to this day, I’m told by some that it’s their favorite Red Cow work. One reviewer referred to it as “the Lord of the Rings of bored high school student projects.” And that’s it’s appeal, really – where another high school project may have lost steam, this one, against a great deal of resistance, was completed, and mostly as intended. But for me, it was life changing. It’s where I learned how to manage teams, how to push through obstacles, to solve large problems by breaking them down into little problems, and most of all, it gave me the self esteem required to call myself a filmmaker from that point on. If that movie hadn’t gotten finished, I don’t think I would’ve pushed through to the next one – or the the next one, or the next one. Sometimes, you run a marathon just to finish it. Sometimes crossing the finish line is the absolutely most important thing. 10 years ago, I was able to start calling myself a filmmaker. If you want to take a look at the film, here it is, in all its glory.